It looks like now you can start earning valuable Thank You points from an invaluable credit card, if you have it. 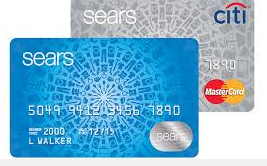 The Citibank issued Sears MasterCard will let you earn Thank You points starting April 16th for every $1 spent. The Sears MasterCard isn’t all that great, as my mom has it, and she opened it a few years ago, to get a discount at the counter. I strongly advised against it, but sometimes Mom thinks she knows everything. In fact, outside of my Mom, I don’t know anyone else who actually has this card. Anyhow, she can now get Thank You points when using her card everywhere. 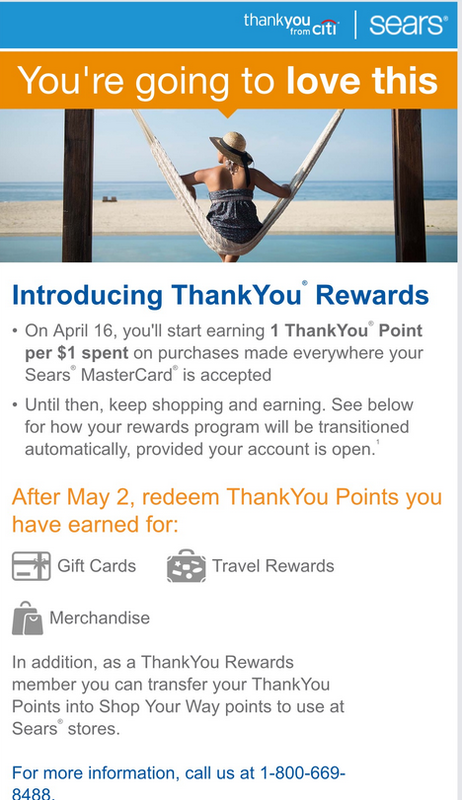 From the looks of the promotion, you can also transfer Thank You points to Shop Your Way points, to use at Sears, Kmart, and Lands End stores, which I highly advise against also. However, to each his own, and always evaluate what rewards YOU think are best. That’s how you get satisfaction and value out of all these points and miles you collect. Personally, I would transfer these Thank You points into one of the many travel partners, such as Singapore Airlines KrisFlyer, or Virgin America’s Elevate program. 2 Comments on "Sears Citibank MasterCard Gets you Thank You Points"
you may be right!..nevertheless, still not the greatest card.